I’m back for another review and you’ll never believe which film I’ve chosen to watch. In my defense – it was a free movie ticket and all my friends really wanted to check it out. If you want to make jokes, I totally expect them. Originally, I planned to write this as a full review since I watched this film a day after it came out but it deserves a mini review. 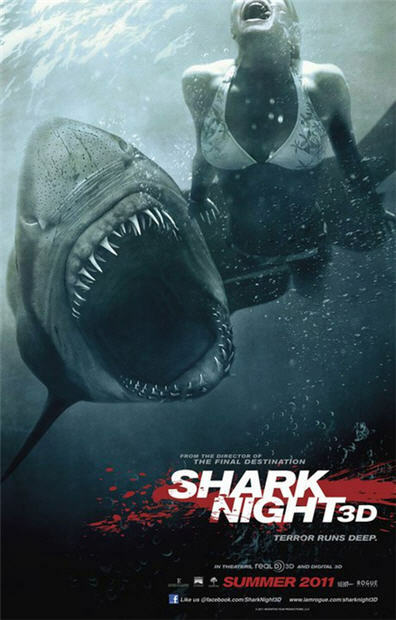 The film review is the 3D aquatic teen horror flick: Shark Night 3D! The Premise: Seven undergraduates spend some quality time at a lakeside island for rest and relaxation, but the situation quickly turns deadly when a pack of vicious sharks start attacking the frightened college students. Not since the days of Jaws does one movie contain an array of shark cast members in the monstrous villain role. Rounding out the cast is the terrified potential victims: Sara (Sara Paxton) , the cute and shy ingénue whom owns the summer home on the island, Nick (Dustin Milligan), the quirky male lead with an attraction for Sara, Beth (Katharine McPhee), the rebellious wild child, and Blake (Chris Zylka), the exhibitionist college party boy, to name a few. This is the lowest score I have ever given for a review. I knew going into the movie that it wasn’t going to be academy-worthy material but even I was blown away. When you’re dealing with sharks in the water, the simplest common sense would be to not go back into the water. I guess that wasn’t enough as the kids just kept jumping back in. The characters had no depth, the plot was nonsensical (seriously, online videos?! ), the suspense was paltry and the 3D effect had no increased value to the film. Once the setting became nighttime, at times it was too dark to see anything which made all that horror and 3D effects pointless. I’ll be the first to admit that I justify and sometimes give the positive benefits of a lackluster film but even I felt disappointed. My recommendation would be to skip the movie and wait till it airs on syndication. Try watching it back-to-back with Jaws then Shark Night 3D – you may be surprised about how you feel afterwards.